Malaga was founded by the Phoenicians in the eighth century due to its prime location in the southern Mediterranean area, which was ideal for commercial ports. The control of the settlement later went to the Carthaginians and then to the Romans who turned the Malaga region into a confederate city. After the collapse of the Roman Empire, in 711, Malaga was captured by the Arabs, which is when the city experienced its greatest progress. Fortifications like the city wall, Alcazaba and the Gibralfaro castle were built during Arab control. In this age Malaga began exporting a variety of products to the entire Mediterranean. The Catholic reoccupation of the city, which took place in 1487, changed the history and culture of Malaga completely. During this time there were major reforms, however they did not lead to the promised success. The city suffered a decline due to a disorganized administration, insufficient harvests, epidemics and natural disasters such as earthquakes. In the 18th century - due to the industrialization and a higher global commercial activity - the city started a revival, so that new factories for steel, textiles and iron were built, which turned Malaga into an industrial hub. When Spain lost the majority of its colonies in the 19th century, Malaga's economy declined again. 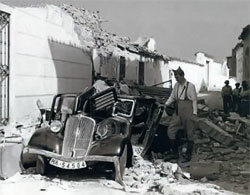 The recovery started after the Spanish Civil War in 1937 and most notably with the appearance of the tourist industry in the 1950's.